The 6th generation iPod nano makes a wonderful watch, but something milled out of aluminum doesn’t lend itself to more formal events. [Ted] liked the idea of an iPod nano watch, but wanted to kick things up a notch and fabricate an 18k gold iPod nano. It took 500 hours and $2500 in materials, but we’d say it’s worth it. The new 18k gold enclosure for the watch was fabricated using the lost wax casting method. First, all the electronics and buttons were removed from the iPod, then a negative mold was made in silicone rubber. A positive wax mold was made with the silicon mold, and finally another negative mold – this time in plaster – was made by vaporizing the positive wax mold in a furnace. [Ted] used two one-ounce coins as the source of gold for his nano enclosure, spun into the plaster mold. From there, it’s just a simple but tedious matter of cutting the sprues off, shaping, filing, buffing, and polishing. With a new leather strap, the iPod is reassembled in its new enclosure. Wonderful work, and amazingly impressive from someone who doesn’t consider himself a jeweler. Before assuming that the title should be “web crawler,” just shush your shussins’ and check out the video after the break. The Pinoccio, as previously noted, is a board in development as a sort of web-enabled by default Arduino. This makes it perfect for a project like this one where a little rover is controlled from 10,000 Kilometers away, or around 6000 Miles for those of us that dwell in the US. 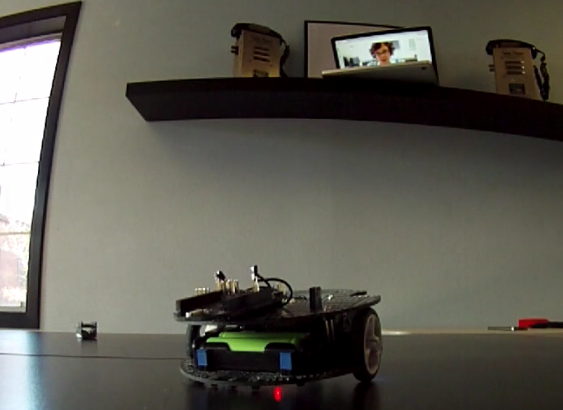 This setup uses a cell-phone accelerometer in Brazil to allow control of this robot in Nevada. Although close, the control isn’t quite real time, so that has to be accounted for. Something like this could be easily used for a telepresence ‘bot. [Hyeinkali’s] iPod Nano looks right at home on the dashboard of his 2001 Honda Accord. He got rid of the simple LCD clock and the buttons that were used to set it. The hack holds the iPod securely in place, but it remains easy to remove and take with you. 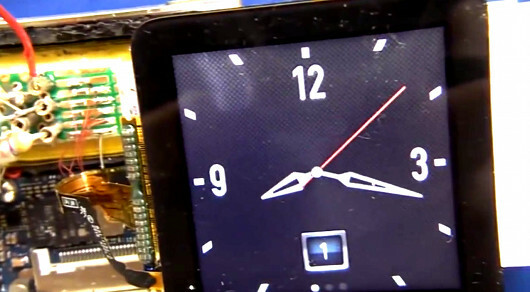 He started by popping out the bezel that holds the clock module and hazard light button in place. The original display was about the same width as the Nano, but he wasn’t interested in mounting the mp3 player under the dash. Since he needed to be able to take it with him to sync his music library he made a space near the bottom of the bezel to accept the connector end of the USB cable while keeping the device accessible. After connecting the other end to power he covered the hole in the bezel with mesh and put everything back together. We’re not sure if audio is piped into the car stereo via a cable or through Bluetooth, but it does feed to the head unit. [Cmonaco3’s] girlfriend wanted a better way to control her iPod when driving. She didn’t want to take her eyes of the road and asked him if he could help. He ended up building a heads up display which reads out track information and offers a few simple buttons for control. The display includes controls for track forward, track back, and play/pause. 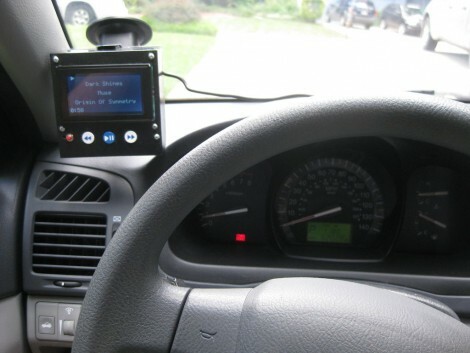 Those buttons, along with the LCD screen, mount on the windshield using a suction cup. This way the driver doesn’t have to completely remove focus from the road to control the iPod which is sitting in the passenger’s seat. To accomplish this [Cmonaco] used a dock connector breakout board for communication between an Arduino and the iPod. The Arduino pulls song information to be displayed on the graphic LCD screen, and sends commands to the iPod when it detects a button push. See a quick demo of the setup after the break. [Tim] wrote in to tell us about his Mark III hard drive in a bell jar, and we were quite impressed! The principle of using a bell jar to protect the hard drive inside so the world can see it spinning is really a cool idea, but his execution of this project is excellent. It was reportedly so good that an unnamed college actually asked him to build one of his drive displays for them. The Mark III is an excellent build, and the little hard drive has been swapped to the front of it for better visualisation. The disadvantage of the iPod Mini used for the Mark III build is that it actually buffers enough so that the read head doesn’t have to spin during the entire song. Because of this, we thought that his first build, nicknamed [pink], was even more interesting, if ever so slightly less refined. By many of our hacking standards though, both are incredibly finished works of art!